August 2015 | ForResidentialPros.com | 21 have all those scratches on them when the job was turned over to the client? An ongoing maintenance agreement can be a big help after you're done with a proj- ect: The builder comes in once a year (or more often if needed), and checks on various items – air flters on the heating system, gutters, plumbing fxtures, appliances and so on. That way, any items that may be getting beyond normal wear and tear can be addressed – and the builder can get paid for fxing subse- quent damage. 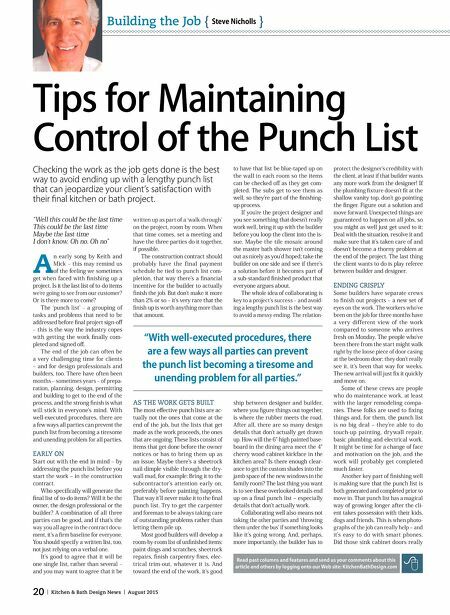 However the punch list gets dealt with, it's often the ending of the work that sticks in people's mind – how those last few niggling items get finished up. Conducting a 'close-out' meeting with cli- ent, designer and b uilder all present a great chance to make sure everything's done to the customer's satisfaction. It also provides an opportu- nity to address any issues, to let the customer 'vent', and to take care of any fnal fnal f- nal items – then move on to the next project! Steve has been in the building business for over 30 years. In 1982 he founded Mueller Nicholls, now a 50-person company based in Oakland, CA. In ad- dition to performing remodeling and construction work, Steve's frm oper- ates a large cabinet shop, building work for their own projects and for other contractors. Married with two grown daughters, Steve enjoys cycling, skiing and being outdoors. He is a frequent speaker on building industry topics. NEW! VolumE 7 • 208 PagE s - Full Color orga Niz E d F or EasE oF usE • aVailabl E iN PriNt a Nd oNliNE NEW! 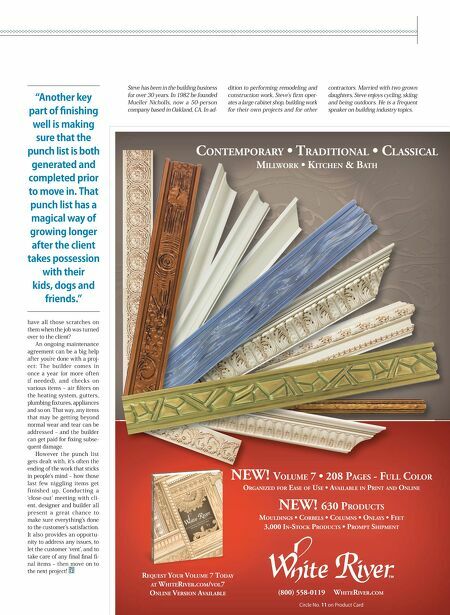 630 ProduCts mouldiNgs • Corb E ls • ColumNs • oNlays • FEE t 3,000 iN-stoCk ProduCts • PromP t shiP mENt CoNtEmPorary • traditioNal • ClassiCal millWork • kitChEN & bath rE quEst your VolumE 7 today at WhitEriVEr.Com/Vol7 o NliNE VE rsioN aVailabl E (800) 558-0119 WhitEriVE r.Com Circle No. 11 on Product Card "Another key part of fnishing well is making sure that the punch list is both generated and completed prior to move in. That punch list has a magical way of growing longer after the client takes possession with their kids, dogs and friends."